Sired By NSBA Hall of Fame stallion Zippos Sensation & out of AQHA Mare who is a full sister Extraordinary Vested Faith. 5 World Champion producers in first 2 generations. Took on the Quarter Horses at Scottsdale Classic and was Res Champion in NonPro & Limited Open 2Yr Old WP. APHA Res WC NonPro 2 Yr Old WP Sweepstakes & 2 Yr Old WP Slot World Show Champion. 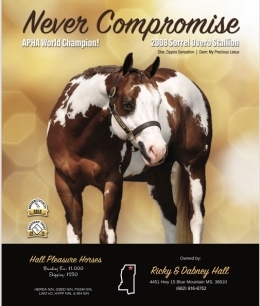 Co-Championships 3 Yr Old Open Color WP Tom Powers Futurity & Southern Belle Invitation. BCF 3 Yr Old NonPro Color WP NSBA World Show. APHA World Champion 3 Yr Old WP. With over $15,000 in LTE, Open & Ama superiors.